The pursuits to reduce costs and avoid unplanned downtime remain primary operational goals in industrial plants. A convergence of factors has created an opportunity for industrial organizations such as manufacturing, oil and gas, chemicals and water treatment companies to aggressively pursue both. 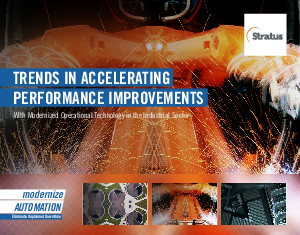 Although the pace of investment can be relatively slow in industrial automation (IA), technological advances, economic trends and market pressures have created an environment in which plants are compelled to modernize operational technology (OT) in order to ensure maximum efficiency and minimum process interruptions. Simply put, OT is getting old. The industrial sector is heavily capital-intensive and traditionally utilizes equipment with long lifecycles. Organizations with such outdated automation systems are in dire need of OT modernization to keep up with the pace of change, customer demands and business priorities, and reduce the risk of critical failures and costly downtime. Download this white paper to learn more!